On the approach to the exams for the new AQA GCSE (9-1) English Language specification, we sat down with teacher, coach, and former AQA principal examiner Jo Heathcote who’s provided practical advice on how best to enable your students to secure a pass. Jo has broken down her advice for each section of the language paper – you can view a short video for each paper and question below. Or, you can watch the playlist of videos here. 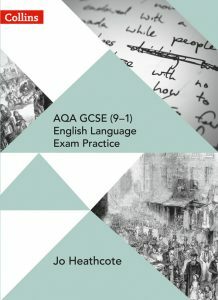 Jo’s new resource mentioned in the videos has been designed to help students hone the skills required to achieve success in the exam. Find out more below. View all Secondary English resources from Collins.